It’s the place to be if you want to be close to nature – that was the thought that came to me when I first laid my eyes on the place. During the trip planning phase, the pictures of Vanaashrya were overwhelming, but it’s nothing compared to the first glance from my car window; the scene before me just blew me away. It was then that I realized my family had indeed planned out something great. Initially, I was pretty reluctant to come. I wasn’t aware of the place, and as they say – the unknown is doubtful. But then as I got out of the car to marvel the mystic beauty of the serene nature surrounding me, I knew what a beautiful opportunity I would have missed had I said “no”. What frightened me at first was the idea of camping in the middle of a jungle. That fear however soon got over me after I experienced the pleasant and peaceful ambience at this tented camp. 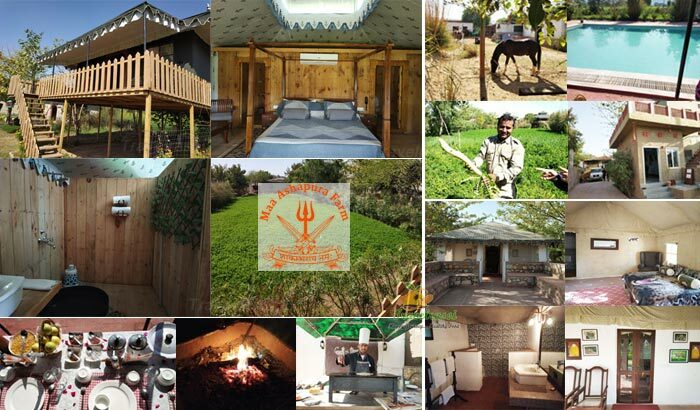 Vanaashrya is a beautiful 12 acres property with tented, luxury camps in the midst of nature. 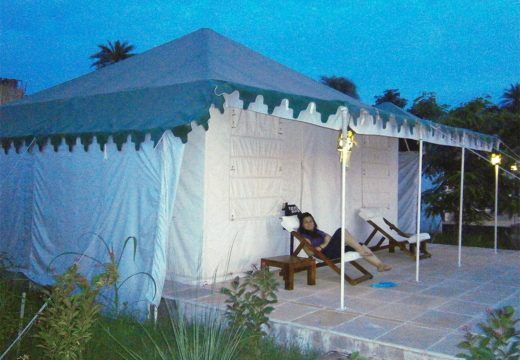 It has a total of 27 tents spread across this sprawling property. The camps are built around a beautiful lake that easily gives the feeling of camping in a real jungle. 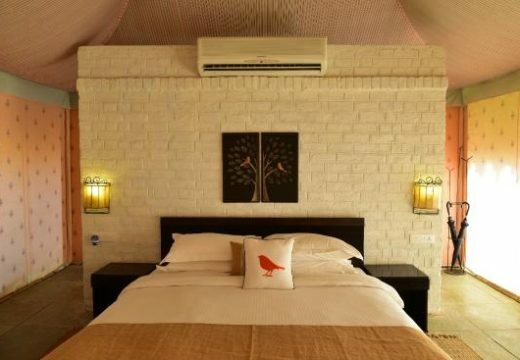 The tents were well equipped with all the modern amenities – a king sized bed, air-conditioning, a study table and an attached washroom with 24*7 hot water. If you are here to relax and do nothing, there is this porch built just outside every tent, where you can sit and enjoy the beautiful sunset in the Aravalli Hills. The Package price for one night is Rs. 8500/- including all 3 meals. Special group packages are also worked out depending upon the number of nights and pax (guests). It must be a huge challenge to maintain such a property, I wondered. The management at Vanaashrya really needs to be lauded, for, in spite of being on the outskirts, you would find access to every kind of services and facilities. Another thing that amazed me is the teeming foreign tourists in Vanaashrya. They especially come to this place to experience the Indian culture in general and the Rajasthani rural lifestyle in particular. And finally our Trip begins…. We were six of us in the group; my husband, me, my sister, brother-in-law, and my brother and sister-in-law. Our trip was planned till Jaipur initially. It was much later that we made up our mind to visit Vanaashrya (I was the last one to be convinced but also the one to have enjoyed the trip most). While in the car I opened their website and scanned through the pictures of Vanaashrya. Since Bhangarh is just 30 mins drive from Vanaashrya, we had the opportunity to visit the Bhangarh fort on our way. This ‘haunted’ place is much talked and written about and I always had the curiosity to see this place myself. It is a well preserved fort that looks splendid from both inside and outside. Because of a 200-300 year old legend of this place getting cursed by a wizard, it has infamously come to be known as ‘India’s most haunted place’. According to many, there are paranormal activities that take place inside the fort at night and these have resulted in several deaths. A notice put up by the Archaeological Survey of India at the fort entrance prevents any visitor to stay beyond 5 o clock inside the precinct. Curiosity got the better of me to know what actually happens here after 5, but alas we had to come out as per the directions. We resumed our journey onwards to Vanaashrya. We reached Vanaashrya at dusk. We booked 3 tents for 3 of the couples. I really loved the indigenous Rajasthani greeting we received; we were given a grand welcome with girls clad in Rajasthani attire garlanding us and applying ‘tilak’ on our forehead. We were then ushered to the place where the cultural function was going on, while our luggage was being taken care of. This cultural get-together is a major highlight every evening, where a folk troupe of Rajasthani musicians and dancers dressed in colorful dresses perform; a bonfire is lit, beside which the tourists are made to sit and watch the show. 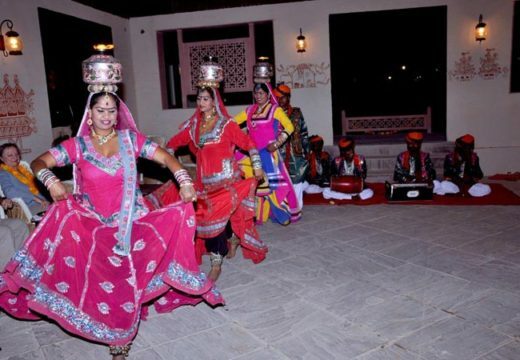 The vibrant culture of Rajasthan gets manifested in the musical performance and the music being very inviting, you would not be able to remain seated for long and eventually get up to shake a leg with the dancers. Despite being very tired, we enjoyed it a lot. We later had a sumptuous dinner at Basil, the multi cuisine restaurant at Vanaashrya that serves both Indian and continental food. 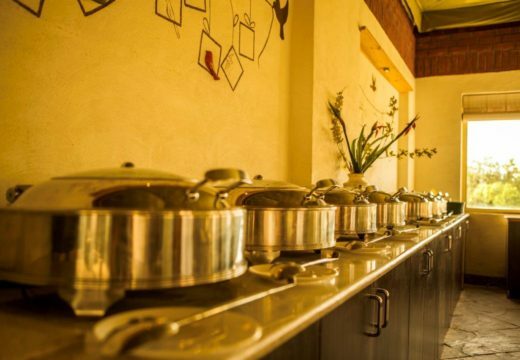 The Buffet menu is an interesting one – you can start your day with Morning Tea, Coffee with Cookies and then have Canned juices, Fresh fruits with either Cereals, Breakfast Rolls with choice of egg, Tea/ coffee & Corn Flakes with Hot & Cold Milk, Porridge, Baked Beans, Bitten Rice (Poha), Poori Bhaji, Masla Dosa With Shambhar, stuffed paratha or Suji Ka Halwa. For Lunch, you can choose from an assortment of food items, starting from Lemon coriander Soup, Green Salad, Chana Chat, Russian Coleslaw Salad, Mixed Veg. Raita, Jeera Rice, Dal Pancharatna, Chicken Kadai, Paneer Lababdar, Veg Kofta Masala, Aloo Pyaza, Tinda Masala, Penne Pasta in alfredo sauce, Assorted Indian Breads, Malai Phirni, Strawberry Cake and Kiwi Mousse. For evening tea you can have Cookies with Tea & Coffee. For Dinner, a lavish 3 course meal will be laid out before you which will include Cream of Tomato Soup, Chicken Hawaiian Salad, Russian Salad, Green Salad, Boondi Raita, Lemon Rice, Mutton Rogan Josh, Roast Chicken with Rose Marry Sauce, Paneer Butter Masala, Bhindi Kurkure, Dum Aloo Chutney Wala, Assorted Pasta with Tomato Basil, Yellow Dal, Assorted Indian Bread Basket, Rice Kheer (Cold), Mango Mousse and Fruit Cake. Since it was a Saturday night, the boys in our group were planning to visit the in-house bar, Cloud 9. But that plan soon got cancelled and we instead went to the poolside and sat up late into the night, gossiping and having fun. There was also a soft music playing in the background and the atmosphere became fun filled. We went to our respective tents and retired for the night when our weary eyes were refusing to give in. With a cool breeze blowing and dark clouds hovering above the distant Aravalli Hills, it was a wonderful experience walking to our tent late at night. I could feel the silence of the night taking away all my fatigue. All the other campers were asleep by then and the only sound that filled the air was that of the chirping of the cricket that came from the marshes surrounding the lake area. When in Delhi, I usually sleep till late on Sundays but surprisingly that was not so while at the camp. The early morning sun rays and the chirping of birds could not keep me away from enjoying the beautiful weather outside. I put on my trek suit and went out to explore the place all by myself. The serenity of the previous night still persists! A trail of 500 mts runs around the tents, perfect for joggers. 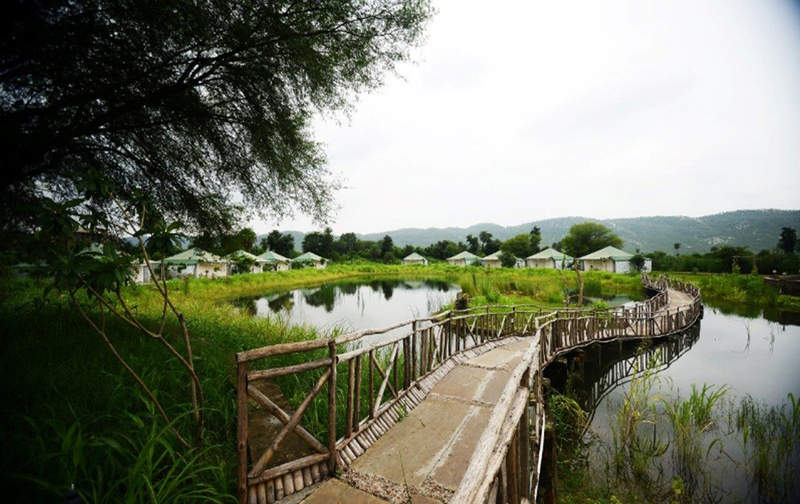 A wooden bridge built over the lake connects the camps with the wellness centre, Vanasutra that houses massage rooms, Jacuzzi for steam and cold shower and a gym. Vanaashrya also organizes yoga sessions on request by the poolside. The pool, adjacent to the lake is a beautiful, secluded place to spend some time in solitude. I went and sat for a while at one of the gazebos built by the side of the pool. Besides relaxing at the pool or the spa, you can also indulge into many other activities, like visiting the kitchen garden and getting familiar to the seasonal vegetables grown here. You can enrich your knowledge of Indian cuisine by taking a few demos from the chef, while getting a taste and learning the secrets behind Indian spices. 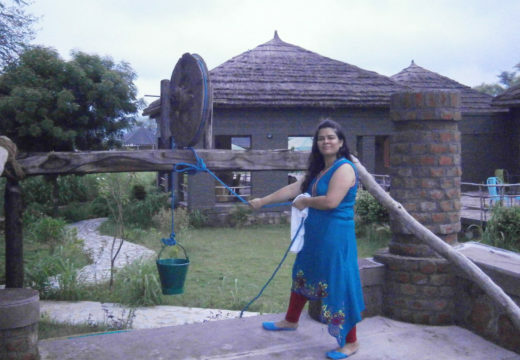 You can also enjoy taking an open shower at the rural style tubewell built to make you experience the rural life. While enjoying the nature, I realized that my phone was ringing. My husband was looking out for me to have breakfast. After breakfast, we got ready to go on a camel safari and make a tour of the countryside. 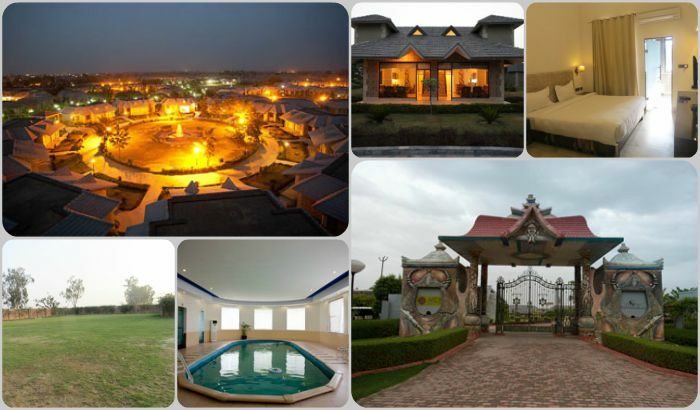 The village touring is yet another attraction while at Vanaashrya. 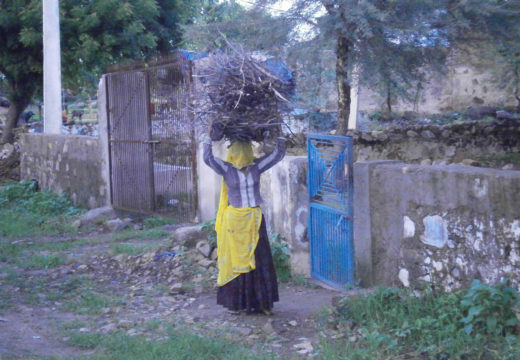 The tour will walk you through the nearby village – the farmlands, cattle and the village folks. You might also get an opportunity to meet with the Sarpanch and interact with the Banjara tribes from this village. 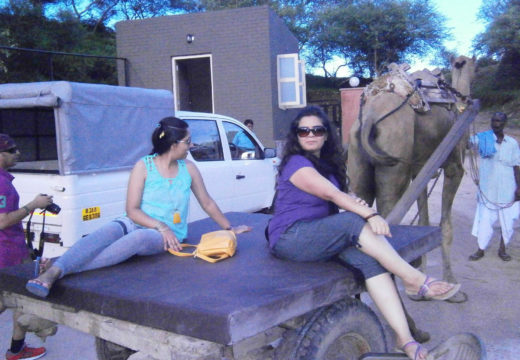 Sitting on a camel cart, we were taken to experience the rural life of Rajasthan. On other occasions, a visit to the nearby government schools can also be organized on special request. 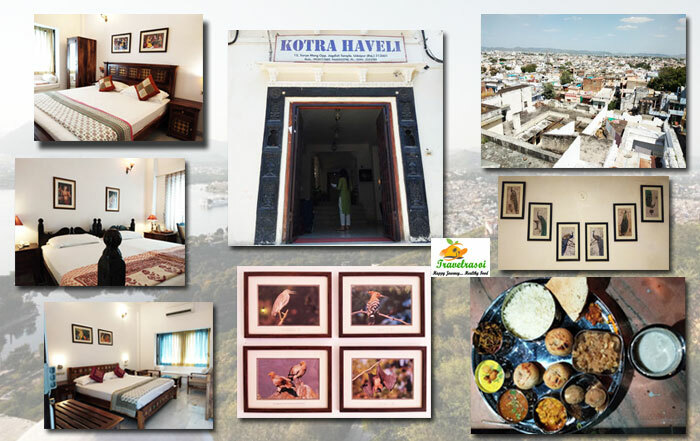 If you are adventurous enough, you can also go on a cycle or a village walk trip on the rough terrain of the Aravalli Hills to explore the nearby places. 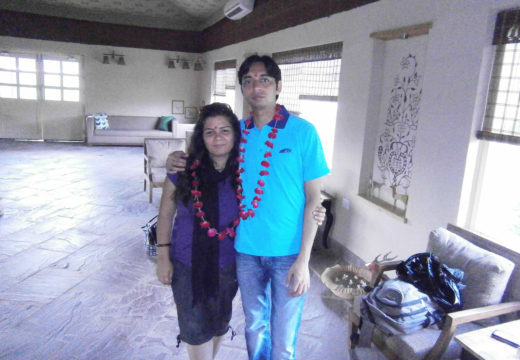 These trips are again organized by Vanaashrya on prior intimation. It was a fun trip as this was something unprecedented for all of us. Passers-by stared us like having seen a foreign object and we felt like kings and queens as we rode amidst them on our cart, smiling at one or two. We stopped at a roadside shop to have tea. The tea-stall owner was a humble man who told us more about the village and how they have grown used to seeing tourists in this place everyday. After touring for more than an hour, we came back when it was beginning to grow hotter. Back at Vanaashrya, we packed our stuff, had lunch and got ready to leave. As the trip was coming to an end, we all looked gloomy and sulked at the thought of coming back to Delhi and resuming the same old routine life. But that is how life has to go on and like every good things that come to an end, the trip also had to end, no matter how much we extend it. I want to relive the Vanaashrya memories again; memories that bring me closer to nature, memories that make me fall in love with the simple things of life and memories that are going to stay with me for the rest of my life. Vanaashrya is one experience that everyone should try it once in a lifetime; because it is there you will realize how beautiful life is away from the maddening crowd. There are several places near Vanaashrya to where you can plan a full day trip and return in the evening. You can visit the Sariska Tiger Reserve which is just 5 kms from the resort. 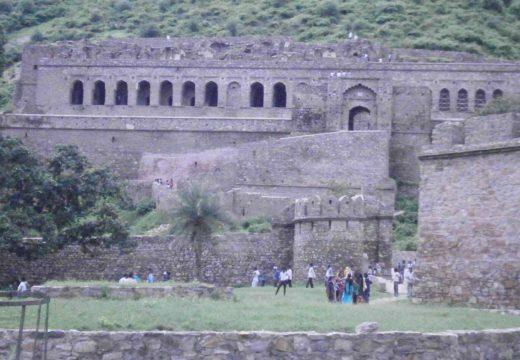 The Bhangarh fort is another place worth visiting. Just 12.5 kms drive from Vanaashrya, there is a beautiful dam which you can plan to visit. 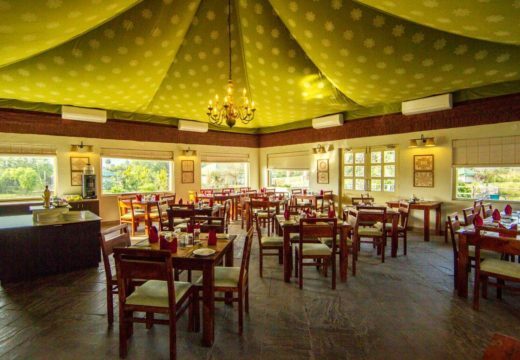 Located in the Alwar – Sariska belt, in the foothills of the Aravalli range, Vanaashrya is 4 hours drive from the Delhi (around 215 kms). The closest airport is Jaipur, which is 120 kms away and the nearest railway station is Rajgarh which is again 25 kms from Vanaashrya. Share the post "Vanaashrya – Where Nature Meets You!"